Winning in sports is hard. The reason why winning in sports is hard is primarily because the other team’s are trying to win too. It’s a zero sum game, even in a sport with draws like soccer. The Philadelphia Union have been doing some winning recently. 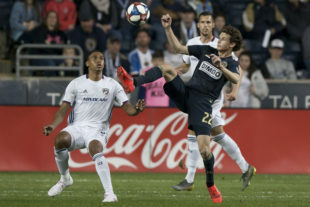 In fact, the suddenly impressive Union have now won three matches in a row, a feat only accomplished four other times in the franchise’s history. They have a chance to win their fourth straight on Saturday night, and it’s worth a trip down memory lane before that happens. The format goes like this: Year, Did they win three straight?, and how did it happen. 2010: NO — This was the “just happy to be here” phase of the Union’s existence. Though they boasted a reasonable home record, a 2-12-1 record on the road made any chance of three straight unlikely. In fact, the Union didn’t even win back-to-back games in their primary season. 2011: NO — After opening their sophomore campaign with wins on the road in Houston and at home to Vancouver, the Union’s chances for three in a row were scuttled by the LA Galaxy. It was a match that featured 10 bookings and 2 sending-offs, and would have been the keystone in an unbeaten-through-six start to the season. 2012: YES — The Union repaid the Gals a year later though, taking all three points in Carson courtesy of a Jack McInerney back heel and a curling, 90th minute winner from Michael Farfan. After coming home and recovering from their jet leg, The Boys in Blue bulged bags of onions and bullied their way to wins over Toronto and Montreal. 2013: NO — Though the good guys had more than one chance at a three-fer during this season, late goals from Theirry Henry in March and Blas Perez in June nullified two-game streaks that never quite became three. 2014: YES — In the late summer, the mid-table Lads of Liberty took the spoils from San Jose and Toronto in Chester, and then ventured north of the border to take three again from the hapless Reds. Home draws against the Red Bulls and Dynamo kept the team from what would have been their largest winning streak of all-time. 2015: NO — In a feat that can only be described as “so Union,” the Sons of Sak beat Red Bulls in Harrison, NJ for the first time ever after stealing a stoppage time victory from DC the week before. Then, club legend Sebastien Le Toux found the back of the net in the 5th minute of the match on the road in the nation’s capital. It was a goal scored too soon, as Benny’s Boys grabbed late tallies in both halves to steal a result. 2016: NO — Warren Creavalle’s red card in Bridgeview kept the team from three straight in the early part of this season, with Tranquillo Barnetta’s 90th minute curler the following week against Orlando the missed chance to make it four. Illinois was the scene several months later when the Union, having beaten the Crew for a second time in Ohio and a 9-man Sporting Kansas City 2-0 in Chester, laid a 3-goal-sized egg and lost to Chicago City’s predecessor club. Of note, the first tally of said match was an Own Goal from Roland Alberg, the first and last time he tracked his man back on defense. Given the outcome, perhaps that was a good thing. 2017: YES — A CJ Sapong hat-trick and Oguchi Onyewu scoring on his birthday were the highlights of the team’s first four match win streak. The team would go on to lose the next three matches thereafter and ultimately miss the playoffs, but those were undeniably good times while they lasted. 2018: YES — Speaking of four in a row, the Union repeated the quadruple again in 2018. Jack Elliot’s two-goal effort in New England started it all, followed by the team’s dismantling of NYCFC. Cory Burke kept the streak running, not stopping for an offside whistle and scoring among the strangest goals in Talen Energy Stadium history. The final victory might have been the most impressive, a midweek dismantling of league darlings, DC United. The 2019 edition of Chums from Chester have already won three straight and are unbeaten through four. Points have come from last year’s MLS Cup winners, the top team in their division, the team with the best Academy in the league, and in a monsoon against the league’s upstarts. To find a fourth, they’ll go to southern California to face a legendary coach, a godly player, and the difficultly of playing sports well past a reasonable person’s bedtime. Winning in sports is hard, after all. Very interesting! You have a career as a headline writer. Great article! Loved the titles! !